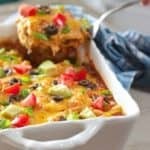 Easy Chicken Enchilada Casserole! 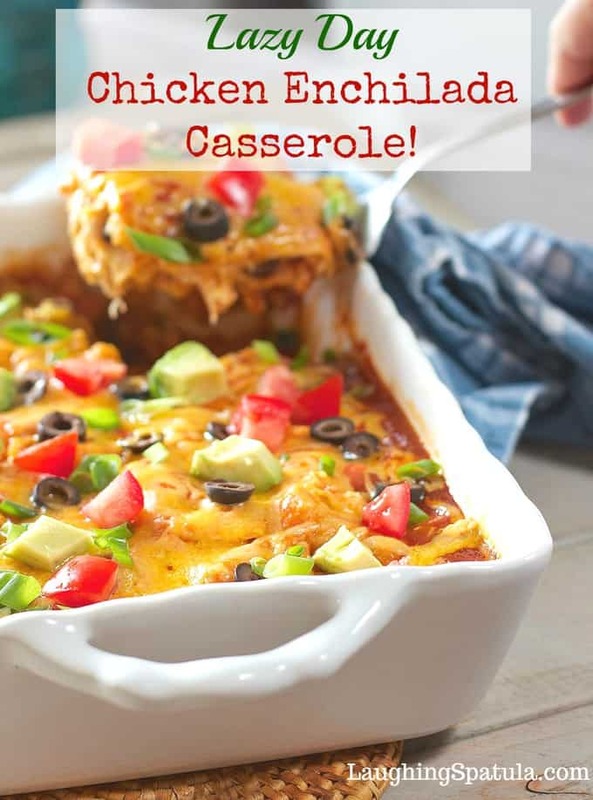 Whip up this easy casserole on a lazy day! Using store-bought rotisserie chicken and canned enchilada sauce, this family favorite comes together in a flash! We all know I am a bit of a lazy cook. And the older I get, the fewer dishes I wanna wash!But I also love, love, love good fresh food. 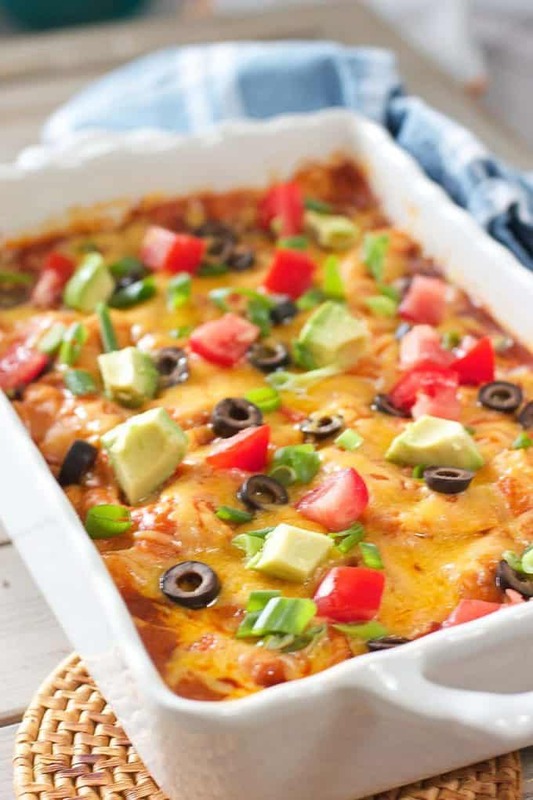 There are times you can find balance, like with this super easy crowd pleasing Chicken Enchilada Casserole! 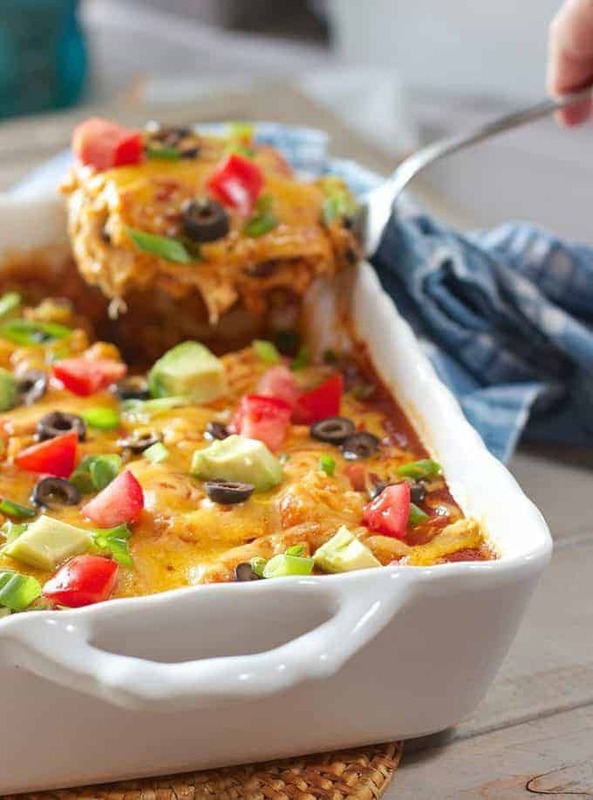 What makes this Lazy Day Chicken Enchilada Casserole so easy to make? I used store bought rotisserie chicken, canned enchilada sauce, canned green chilies, then topped it with a few tomatoes and an avocado to give it a fresh kick. I opted for corn tortillas because they are 100 calories less than flour tortillas, (and as you know, I’m always watching my calories!). But if you are skinny, flour tortillas would work great too :). A simple layer of sauce, shredded chicken, cheese, green onion and canned green chilies. Two layers and end with sauce. 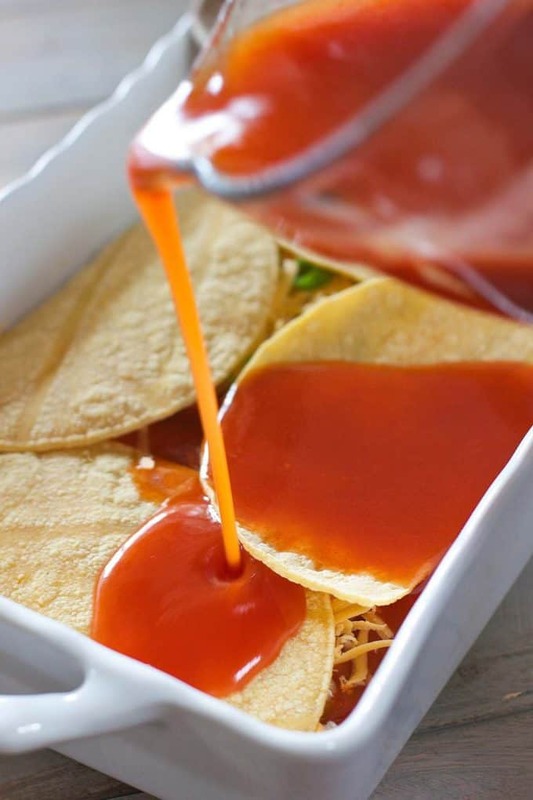 You don’t even have to heat the enchilada sauce…I know! Told ya I was lazy. Bake it for about 45 minutes and you have dinner tonight and lunch tomorrow. This casserole can be made in so many different ways. Here is a little list of subs and add ins. SUBS and ADD INS for Lazy Day Chicken Enchilada Casserole! Sub flour for corn tortilla. Add in a can of corn thats been drained. Divide it into each layer. Sub green chili or salsa verde for red enchilada sauce. Toss in cubed zucchini or eggplant. Sub diced white or red onion for the green onion. Sub cooked ground beef for the chicken. Add a layer of refried beans on top of the tortillas. I’ll just bet, if you rummage around in your fridge you can come up with even more stuff! If your still craving some Tex Mex or Mexican flavors, check out my faves below…. Tex Mex Chicken Skillet – you won’t believe how easy and full of flavor this is! Southwest Chicken and Rice! – A true one pan wonder! You even cook the rice in the same skillet! To healthy, fast and fresh dinners for the lazy cook in all of us! A super easy, fast and fresh casserole that comes together in a flash! Preheat oven to 375 degrees and spray a 9 x 13 baking dish with non stick spray. You will have about 1/2 cup grated cheddar left to top casserole with when finished baking. Spray a piece of aluminum foil with non stick spray so it doesnt stick to the top of the sauce, and cover pan tightly. Bake at 375 degrees for 30 minutes. Insert knife in center to be sure casserole is heated through and tortillas are soft. Spread with remaining cheese and bake an additional 5 minutes. Top with chopped onions, tomatoes and avocado. Serve with sour cream and salsa if desired. Oh, and we use flour tortillas instead as well (after heating them up in a hot pan really quickly.) Can’t wait for leftovers tonight since I just made it last night :). I love that you mixed it all up…. Way to make a recipe your own! Thanks tons for leaving such a nice note! I’m making this for the first time tonight. But I’m wondering, at what point do you add the chicken in? argh! I updated to a new recipe card system and some of the recipes didn’t convert properly! I am so sorry! updated the recipe! My husband is going to ask me to marry him again, once I show him this recipe! Enchilada is his favorite! I’m with you on not wanting to do dishes. We don’t have a dishwasher yet (wah) so the fewer dishes to prepare a meal, the better! You made me laugh! Hope you get a chance to try it…let me know if he proposes LOL! Wish that you had added nutrition information with the recipe…. The casserole sounds good, but I cannot fathom buying canned enchilada sauce. Even here on the border with Mexico they do sell it, but I would rather take the time to make my own, and it would be salsa verde. I still remember a chicken enchilada casserole I had in college that used cream of chicken soup and canned green chiles, with chicken and corn tortillas. I lost the recipe years ago, but your recipe sure brings back good memories, even though I probably wouldn’t make the casserole with canned soup any more. 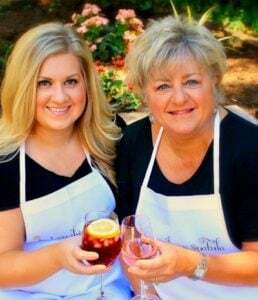 Hi Susan – everything homemade is better, totally with ya on that! But this sure is good in a pinch! Perfect! Dinner tonight and lunch tomorrow. And . . . using corn tortillas makes if gluten-free! Even better Elaine! Thanks for the note!